On a day when there’s lots of activity (um…that would be every day), it’s so nice to have a meal like Cheesy Beef and Rice prepared in the freezer ready to pull out and bake. Quickly toss a salad and warm up a veggie, and your meal is made! Over the next several weeks, while I continue to post new breakfast ideas, and great ways to eat lots of fruits and veggies – I’ll also be posting some great recipes that you can make up ahead of time and put into the freezer to have on hand for busy evenings. To start us off, here’s a super easy recipe to put together. There’s nothing fancy about this dish, but it’s tasty just the same. 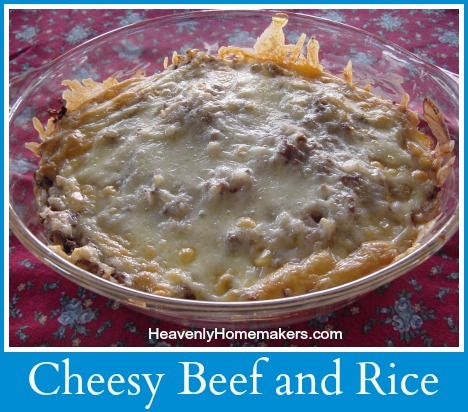 This Cheesy Beef and Rice has been a long time family favorite of ours! Sprinkle cheese on top. Cover well and freeze. Bake in a 350° oven for 45 minutes, or until bubbly. Or, place frozen casserole, covered with foil, into a cold oven. Turn oven on to 250°, baking for about 2 hours or until casserole is heated through and through. I hope you’ll keep coming back to read more recipes of dishes that you can make ahead of time and put into the freezer! In the meantime, I encourage you to look through all of the Make-Ahead Meals we’ve shared through the years. So much time saved! Wow! That sounds really good! Our weather is finally warming up and we spend so much time outside that quick meals are a necessity! I usually have hamb. and rice already cooked in portion sizes in the freezer so this sounds like something I could throw together quickly! Thanks, I’ve bookmarked you and will visit again! Oh, this looks yummy! I need to get some brown rice, but when I do, I’m totally making some! Thanks! Foods should be thawed in the fridge or using the microwave. By thawing on the counter you cannot keep the food at a safe temperature and could expose yourself and your family to unsafe toxins and food poisioning. In response to the thawing comment- I often freeze prepared lasagnas (uncooked noodles, not baked, just assembled). Where I would normally cook this recipe for about 45 minutes if fresh, I usually find that about an hour and ten minutes will cook it directly out of the freezer. I will cover it for the first half, so it does not burn outside before cooking inside. This may be a good alternative to worrying about thawing at room temp OR using the microwave if you share concerns about the damaging effects it could have. I would think this method could work on this dish as well! It looks delicious by the way. I think I will add it to my freezer cooking list! My husband loves any combination of cheesy and beef!! I need to get back to preparing more meals for the freezer! Thanks for the inspiration, even 7 months later! This sounds great – and something that my family would like to eat. I’m going to try it out next week. It is good! We had it for dinner tonight (and there is now one in the freezer! Yay!). Of course, with my husband helping, a few hot pepper flakes got added on at the end, but thankfully it wasn’t too hot and tasted delicious. I’m looking forward to having the next one when our baby gets here! We are going to have this tonight for dinner! This sounds delish! Have you ever made it w/o the sour cream? Or is it a noticable taste? We have some picky eaters in our home! We had this for dinner tonight and it was delicious with sweet corn on the side. To the previous poster – I don’t think you could leave out the sour cream. It forms most of the “glue” that holds the casserole together! You could try substituting with a white sauce, but at that point it would be an entirely different recipe. Thank you so much for the recipe. Thank you even more for the time you put into your blog. I appreciate the ideas and inspiration so much! That sounds sooo easy and delicious. I’m going to try something similar with elk. Plain yogurt is a healthy alternative to sour cream and can be used pretty much the same. Thank you for sharing that. I will definitely try your suggestion. I always have plain yogurt in the house. Just thought I’d let you know I tried this with elk burger. It turned out great except it was dry. It needed more milk or sour cream. Probably because the elk has practically no fat. So if you make this with wild game just add a bit of the creamy yummy stuff. We have lots of deer also and notice it does lack in fat. We remedy this by adding a chunk of grass-fed beef tallow, purchased online, to the cooking dish as it goes in. Yummy! I made this for dinner tonight and everyone loved it.. Thanks!! I’m making my second batch for dinner tonight. I doubled it last time – it is the *perfect* recipe to double-as-you-cook (with no extra effort). My family loved it. I like a previous poster’s idea of serving with beans for Mexican food. This will definitely be on next week’s menu. I made a variation of this tonight with 2 cups of black beans and 2 T taco seasoning stirred into the meat/rice mixture. I also omitted the sour cream and milk in the dish and made the whole thing on the stove and melted cheese over the top with a lid on at the last minute. We ate it as a sort of dip with tortilla chips. We called it “burrito dip.” We had salsa, sour cream and guacamole (for the smart folks among us ;)) on the side. So yummy! I have made this several times and love it. I do add some spices to the meat so it is more like taco meat. I also add black beans. It is so yummy!! My daughter loves it with tortilla chips. This is a big hit around my house! What a GREAT way to get my family to eat brown rice. I have made this a few times and we always eat the entire casserole dish. My adult sons dropped in for dinner last night and they gobbled it up. thanks for another yummy recipe. Made this tonight and loved it! Yay for a new healthy recipe! This is a great replacement for those cream of chicken soup from a can recipes. :) I may add some chicken bouillon next time since I made it with ground chicken. I was just wondering if you’d thought about doing a freezer meals e-book? I would buy it! I know you are super busy, so no pressure! You are so sweet! Yes, I would like to creat an ebook like this someday. In fact, I started one a couple of years ago. Other things keep creeping up ahead of this, but someday I think it will happen! Thanks for your encouragement! I made this with long grain white rice the other day because i didnt have the time to cook the brown rice. it was really good, and my husband suggested i make some changes to it the next time.. chicken, instead of beef, add broccoli, and cheese. yummy either way. I decided to try this last night, as I had everything on hand. As I was making it, and looking at the simple ingredient list, I became skeptical. Would it really taste good? YES, I was so surprised! My husband even asked what all was in it, wanted to know what kind of seasoning I had used. (Had to admit none, I forgot…). The only changes I made were to use ground venison and added a can of beans. We will be repeating this one, thanks!! OK, made this tonight… YUM! Oh, and I did tweak it a little. I added about 5 spoons full of salsa. (We are from the south and love TexMex! LOL!) I was also thinking that corn or black beans might even be good thrown in. Thanks for the recipie! I have been wanting to make this for a few weeks. I did not have enough tie to make it for dinner yesterday, so I decided to make it after dinner, for tonight. After putting it together, I put a few scoops in a little baking dish and heated it up just so I could “sample” it to make sure it was okay for dinner. I LOVED it. It seemed too simple to be good, but it was so good, I secretly had some for breakfast this mornign too. Can’t wait to bake the rest for dinner tonight. Okay so I made this for dinner tonight. I used an entire fresh onion and added a package of frozen lima beans. My family LOVED it!!! My husband actually said he would ask me to make it again….which is the highest rating he gives! I made this tonight, for dinner. Often, I’ll adjust a recipe for what I like or know my family prefers, but I made NO changes to the ingredients. It was delicious! The whole family loved it. I did double the recipe, because we are 4 adults, plus my daughter took some to her boyfriend on his dinner break at work, and I knew hubby and maybe my daughter would take some for lunch at work the next day. I just doubled everything, put it in a lasagna dish, and baked for 20 minutes to melt the cheese. YUM!!! Thanks, Laura! I made this last night for my family. I added 2 tbsp of taco seasoning to the ground beef. We ate it with some sour cream & tortilla chips for the ones who wanted to dip. Yummy! I made this for dinner tonight. Because it’s so hot here, I didn’t want to turn the oven on. I browned the beef & onion, made the rice and then mixed them together with the other ingredients. I sprinkled the cheese on top last and let it melt while I set the table. DH & I loved it!! The kids…not so much, but 2 of them ate it so they could have ice cream for dessert. :) I used 6 ounces of plain yogurt in place of the milk & sour cream. My mother thawed meat in the sink and I did for years. Never a problem. Doesn’t the part that’s frozen keep the outside cool enough? Of course, once it is thawed and if it stays at rm temp for hrs, there is a problem, but 3-4 hrs for a hunk of meat sounds safe to me. I have left things in the fridge over nite and found them pretty much rock hard the next morning. I left out the milk and added medium picante sauce, a can of pinto beans and some sharp cheddar in the mixture as well as on top. Thanks for the recipe. Delish! I am just starting out trying freezer meals. I only made one casserole of this the first time in case we didn’t like it. Even with fresh onion & garlic, and our favorite extra sharp cheese this was pretty bland. I would eat it again if it were something the kids really liked… but not so much. The youngest refused it, while the older 2 ate all their broccoli and left this for last (even though they were excited to try it since I called it ‘hamburger helper’… so I knew they weren’t thrilled with it! I may try it again with some more seasonings… maybe seasoned salt instead of plain sea salt would help…? Wondering if this would work with quinoa instead of rice? I’ve not frozen it, yet. We had this for dinner last night. I used fresh garlic and added some dried oregano and black pepper too. I enjoyed it, but it was a bit bland. I plan on adding some salsa next time I make it. This was great!! Both of my kids give this a thumbs up! Only thing I did different, was add a little pepper and one fresh garlic clove. I made this wonderful recipe for lunch/dinner today. I used 1/2 onion, a pint of homemade salsa & used country wild rice blend. This is a keeper recipe!!! Can anyone tell me approximately how many this recipe serves? I am serving 250-300 college kids and this seems like something they would like. This was DELICIOUS! Can’t wait to make it again and freeze for a busy day! THANKS!!!! Someone else mentioned that they would buy a freezer-cooking book. I actually just went to check for one and was surprised there wasn’t one. Make one Laura! You have so many good recipes! I thought I would share our variation to this recipe. I added ingredients to make it like the inside of a 7-layer burrito from Taco Bell. The best part? All healthy ingredients! Yay! Assembled all the warm things in the bottom of a 9×13 pan. I have frozen this also just leaving the fresh toppings for after it’s been thawed out and warmed up. Served on homemade tortillas…wonderful and it goes a very long way! This was excellent. I’d stopped making Tater-tot casserole, as I didn’t know how to do it without a cream soup added to it. This is it. The rice and meat mix with the sour cream is perfect. Followed the recipe as is and had a family that enjoyed it thoroughly. May add the tater-tots to the top next time for old time’s sake. Did anyone else have trouble with this recipe not making enough. It said it was for a 9×13 casserole, but I had to double this recipe to make it enough for a 9×13, it would have maybe only served 4 people…am I missing something. I could not come up with it serving 10 people, at all. It is because of the long grain rice? I used short grain. You make a great point. When I answered the question above to say that it would serve 10-12, I must have been thinking of how I prepare it (which is doubling or tripling). So sorry about that! I’ll edit the recipe to be more accurate. I think this would be a great filling for stuffed bell peppers! I’d like to line the dish with bell pepper halves, full them up and surround with the leftover mixture. This is such a great inexpensive recipe. I always triple this recipe because my family loves it so much. It is really good with taco seasoning in the meat and I also add salsa. I love to make this in my instant pot. I start with the dry rice and add chicken broth and cook on the rice setting. After it’s done cooking I take the rice out and set it aside and turn on the sauté function at my ground beef my seasonings onions etc. and cook until done. I add the rice back, and the rest of the ingredients and then turn my instant pot to slow cook. It cooks the rest of the day while I am able to go about my day , which right now as spring is starting to slowly appear I’m outside in the garden as much as I can be. There is nothing better then after a day of working outside to coming in to a nice warm dinner like this. Thank you so much for this great recipe ! Our family has named this cow in a rice field. Just fixed it last night. Yummy!